The Wilderness School is run by the CT Dept. of Children and Families and fosters self esteem, personal responsibility, and interpersonal skills of young boys and girls attending the program. As part of the program, the kids are required to perform community service. The Land Trust and the Wilderness School have developed a close working relationship over the years. Starting in 2014, kids have come every year to help improve our trails and wildlife habitats. We feel that it’s a terrific program. Most recently (11/3/18), a group of 11 kids and three counselors helped to gravel over a “rooty”, 400 ft. section of trail at Bull Pond. They loaded about 5 yards of process gravel into wheel barrows and hauled it over 1,000 ft. along the trail section in need of repair. The trail in this area was worn down due to heavy foot traffic. Because of their hard work, the section is now safer to walk over. Land Trust members who worked with the kids (Larry Connors, Bob Hart, Dan Lyga, Bob Orciari, and Eric Rahn) had an enjoyable and productive day. As usual, they found the kids to be enthusiastic, hard-working and just a lot of fun to be with. The Land Trust and Wilderness School continue to have a strong relationship thanks to the coordination efforts of Land Trust Director, Steve Craig. A steady stream of wheel barrows constantly came in for filling. The kids had a long haul to get to the section of trail in need of repair. 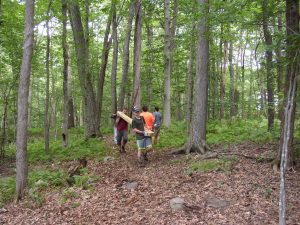 On 8/7/18, a group of seven kids and four counselors from the Wilderness School came to our Indian Meadow property. Despite the day’s hot, humid weather, the kids helped us haul a massive amount of lumber and concrete blocks to stream crossing sites. At the stream crossings, Land Trust volunteers will construct six footbridges and four boardwalks. 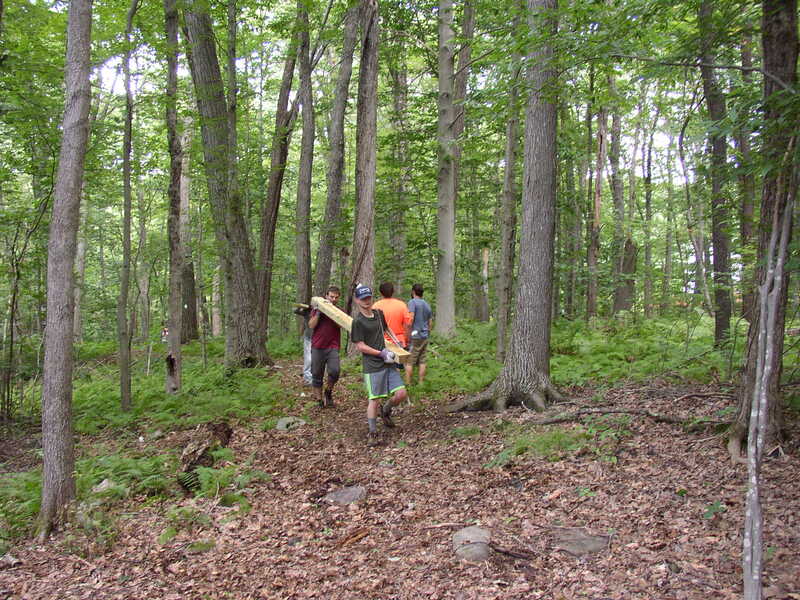 The Wilderness School was a big help in development of a new trail system at Indian Meadow.